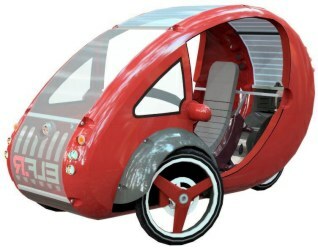 Organic Transit Vehicles, or OTVs, are a new class of velomobile. OTVs feature solar electric assist, disc brakes, and spacious interiors that keep you out of the elements and in view of other drivers. Our vehicles are designed to make bike commuting accessible and affordable for the many, not just the few. OTVs are the perfect solution for people who want to get out of their cars but need or want more than a traditional bike can offer. If you want the benefits of a bike without the hassle, this is just what you have been waiting for. Use an OTV for your commuting or delivery needs to save thousands of dollars each year. With all of the money you can save on fuel, registration, and insurance, an OTV pays for itself in no time at all. Skip the gym and get your exercise during your daily commute. Use the motor to get to work on time without working up a sweat and then fit in a workout by pedalling on the way home. It's great way to relieve stress and burn off some steam at the end of the day. Burn some calories on your way to do the shopping and then haul home your purchases with ease. The electric assist allows you to customize the amount of effort you expend getting where you need to go. Pedal all the way, get a boost on hills, or just sit back and enjoy a quiet ride. It's up to you! Commuting to work each day can now be the cleanest, greenest thing you can do for your community and planet. With an OTV, you can be part of the solution not the problem. Each OTV can go for 1800 miles on the energy equivalent of one gallon of gasoline. Every trip taken in an OTV not only reduces our reliance on fossil fuels, but also helps protect our environment for future generations.